Why is Spain a superpower in mobile app programming today? Home » Mobile App Development » Why is Spain a superpower in mobile app programming? Why is Spain a superpower in mobile app programming? When comparing wages in Spain with those in other programming superpowers, we realise that the former are below average. The contrast is surprising when it comes to software development. And it’s not the result of a lack of talent for website and app programming. European statistics show us bluntly that wages in Spain are low. And on a personal level, Spanish workers are amongst the most unhappy regarding their wages. The fact is that hourly earnings in Spain have plummeted 39% in comparison with those of other European countries. As pointed out before, it’s not a matter of a lack of talent. Spain is one of the markets with a large volume of app programming experts. A brain drain has been occurring from Spain into those EU countries where wages for this kind of specialist jobs are higher. The most common destinations are France, Germany and the United Kingdom. When focusing on mobile app programming, we perceive that the Spanish market has a wide variety of professionals. Generally speaking, it’s not a fully developed market in terms of having taken the leap into the mobile era entirely. Companies wishing to take such leap are nevertheless not willing to make high investments. The thing is that software developers — either of apps or websites — are very valuable assets within a company. However, they are an expensive asset too. Many companies opt for outsourcing development services when facing this situation — sometimes to other European countries. Spain begins to take shape as the European market for hiring specialised developers. Quality at an affordable cost. Countries like France or the United Kingdom resort to Spanish developers to obtain quality work at a lower cost than that to be found in their own markets. Why not? Spain is a good market for hiring app programming developers and experts. And it’s also a good place to outsource development tasks of any kind. Yeeply’s experience on the matter includes dozens of companies that have hired mobile experts to create their mobile applications. French, German and British companies have relied on the quality offered by Spanish programmers and Yeeply’s service. As well as for selecting professionals to programme their digital and mobile projects. There are some success stories within our platform to be mentioned, like the environmental application LeClubBio for the French market or Shareboat‘s design. In fact, Yeeply can bear witness that there is a very broad developer community. We have more than 8,000 industry professionals in our database, although we only work with those who we know well, meet their deadlines consistently, and are able to deliver quality jobs and compete both in quotations as in professional experience in the markets in which we are present. Higher quality: Spain has quality developers for creating applications of any kind. From games to m-commerces. Lower cost: We offer competitive prices in addition to quality. The standard of living and wages are lower than in other European Union countries. Thus, a quality product may be developed at a lower cost. Security, confidence and professionalism: Having certified professionals who specialise in the technologies required for the different projects provides greater security to companies outsourcing these processes. Businesses are able to establish temporary projects with experts in Android, iOS or any other technology through Yeeply — with the security of receiving the agreed-upon work within the established deadlines. Mobile app programming is not the only industry in which Spanish professionals excel. In fact, Spanish talent stands out for creating new technologies. The relevance of the expansion of new fields within the development industry is noteworthy according to the latest report on the status of developers powered by Vision Mobile. Augmented reality. It’s a topic we’ve been talking about for months on our Blog. We have detected in fact many business opportunities in fields such as health or education. Virtual reality. Virtual reality has become a new trend during 2016. Many gaming companies are betting on this technology. It’s trendy because it allows users or customers to fully enter into a virtual environment and enjoy what it has to offer. Developers are aware of this tendency and are beginning to specialise in these technologies that attract businesses. Data Science & Machine Learning. It’s the data science that empowers us to carry out data analysis and to establish models and patterns to be applied in various fields. Artificial intelligence — or the processes by which machines learn — is also included within this area. This is another area in which specialised developers are beginning to emerge. Messaging Bots. We have discussed this topic in one of our previous articles: developing bots for companies can be a good marketing strategy. They can work as customer service bots or be used for service automation. Companies have already been taking this kind of software development into account for a while with a view to enhancing their operations. These development areas let us be aware that apps are not the only thing that will be defining the future. Innovative mobile development will have great relevance. In fact, over half of the developers work on things that will run on smartphones. 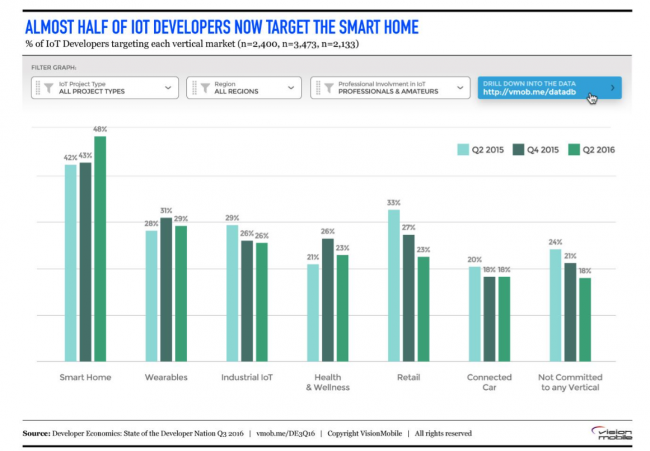 They are engaged in these new technologies and in the Internet of Things (IoT). It’s quite evident that these professionals seek to specialise beyond app development. This is due, in turn, to the demand of companies. Spanish professionals are adapting to these new trends and are becoming specialists in several technologies. Android and iOS mobile development keep on leading the way, but an increasing amount of industry players are adopting these new trends. Either way, there is no doubt that the Spanish market offers talent in web and mobile development — as well as in new technologies. It’s a good place to develop innovative and quality projects. How do UK Startups Use IT Outsourcing to Get Things Done?